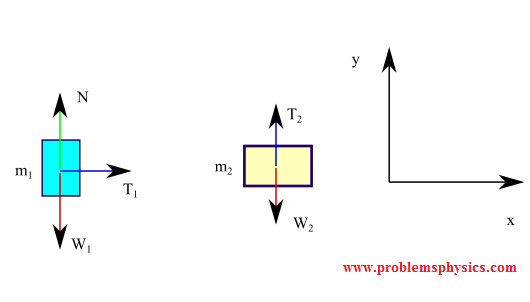 Several problems with solutions and detailed explanations on systems with strings, pulleys and inclined planes are presented. 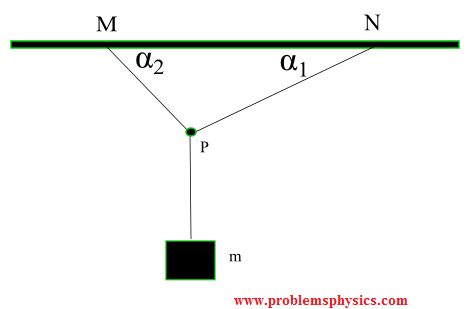 Free body diagrams of forces, forces expressed by their components and Newton's laws are used to solve these problems. Problems involving forces of friction and tension of strings and ropes are also included. 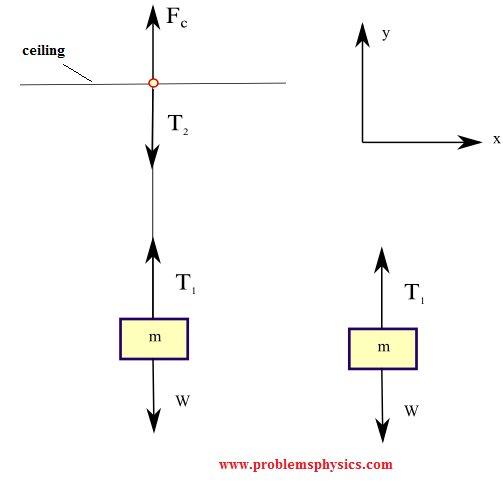 A block of mass 5 Kg is suspended by a string to a ceiling and is at rest. Find the force Fc exerted by the ceiling on the string. Assume the mass of the string to be negligible. 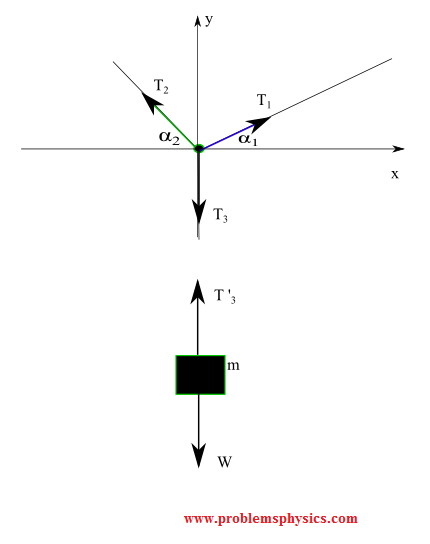 The free body diagram below shows the weight W and the tension T1 acting on the block. Tension T2 acting on the ceiling and Fc the reaction to T2. 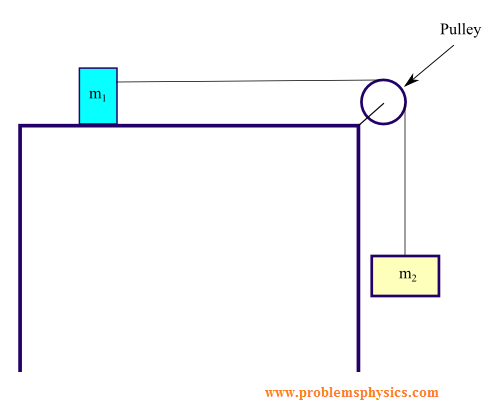 In the figure below is shown the system below are shown two blocks linked by a string through a pulley, where the block of mass m1 slides on the frictionless table. We assume that the string is massless and the pulley is massless and frictionless. Newton's second law, assuming m1 accelerating from left to right and |a| is the magnitude of the acceleration. 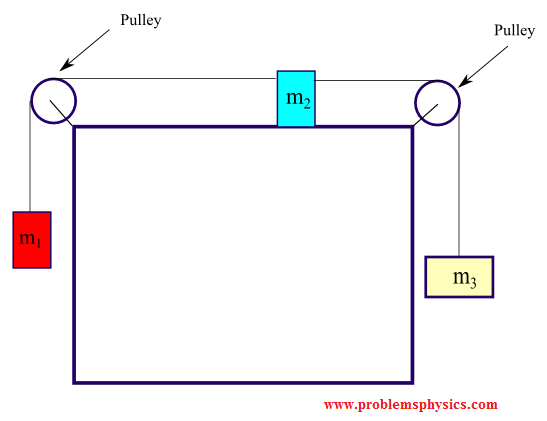 In the two blocks of masses m1 and m2 and pulley system below, the pulley is frictionless and massless and the string around the pulley is massless. Find an expression of the acceleration when the block are released from rest. Let |a| the magnitude of the acceleration of m1 and m2 assuming m1 accelerating upward and m2 accelerating downward. a1 = (0 , |a|) acceleration assuming m1 accelerating upward. a2 = (0 , - |a|) , assuming m2 accelerating downward. 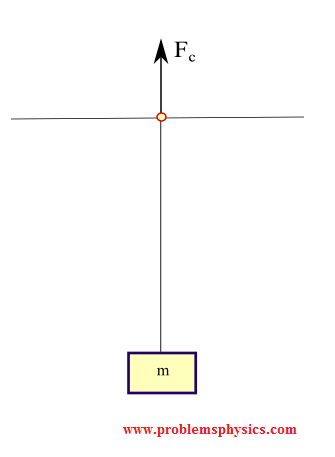 T1 and T2 represent the tension in the same string and therefore their magnitudes are equal. 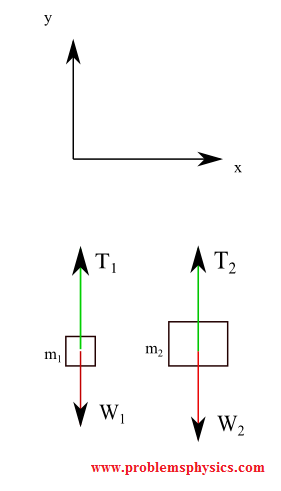 Three cords are knotted at point P, with two of these cords fastened to the ceiling making angles α1, α2 and a block of mass m hangs from the third one as shown below. a) Find the magnitude of the tension in each cord in terms of α1, α2 and m so that the system is at rest. b) Find numerical values to the three tensions found above for α1 = 45° , α2 = 30° and m = 1 Kg. The above is a system of 2 equations with 2 unknown |T1| and |T2|. 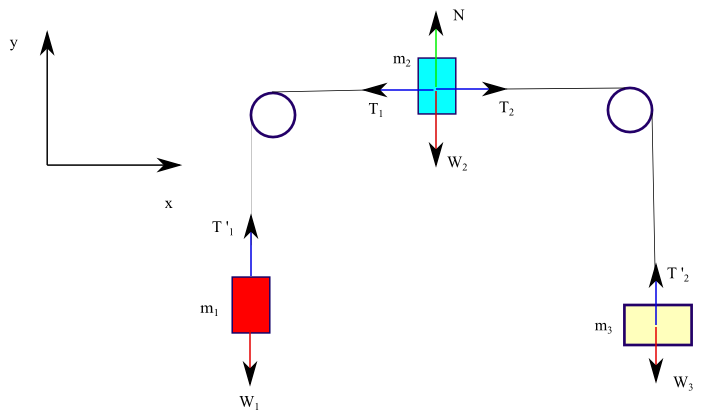 The system below includes 3 blocks of masses m1 = 1 Kg, m2 = 2 Kg and m3 = 5 Kg linked by massless and frictionless strings and pulleys. a) Find the magnitude of the acceleration of the 3 blocks. b) Find the magnitude of the tension of the string between m1 and m2. 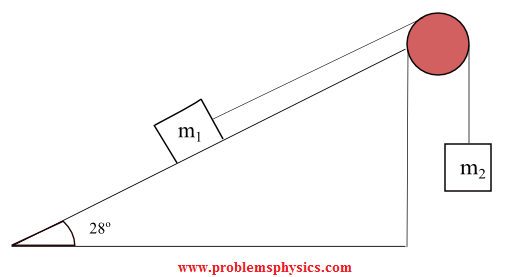 c) Find the magnitude of the tension of the string between m2 and m3. We assume that m1 is accelerating upward, m2 from left to right and m3 downward. We apply Newton's second law for each block. |a| is the magnitude of the acceleration of all 3 blocks. 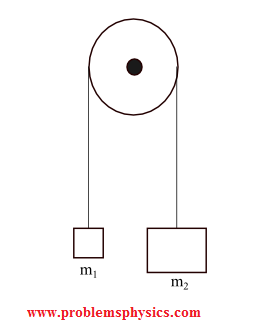 In the system below, blocks of masses m1 = 10 Kg and m2 = 30 Kg are linked by a massless string through a frictionless pulley. a) Find the magnitude of the acceleration of the two masses if the coefficient of kinetic friction between the inclined plane and mass m1 is equal to 0.4.
b) Find the magnitude of the tension in the string. T = (|T| , 0) , tension of string. W2 + T ' = (0 , - m2|a|) , where |a| is the magnitude of the acceleration.